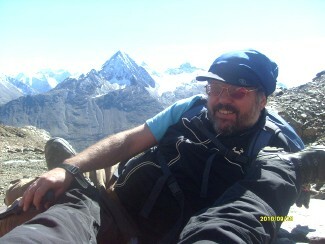 Laissez-faire at 3000m. 2010 had lot of spectacular highlights for me, as artist as well as explorer. In the photo you see the Kreuzspitze (3455m), behind its glacier Ötzi was found. Celebrating 30 years of Science Fiction and Fantasy art I presented my newest set of artworks "Space Rebels and Explorers" at the Austria Con 2010 in Vienna. 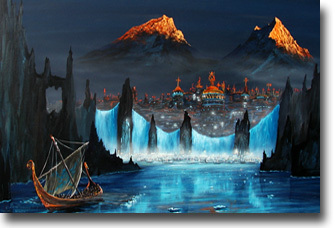 This painting of the series "Mythic North" shows Asgard in my personal dream visions. The artwork "Nova Roma" was completely created through entries and scetches in my "Dream Dossier"
Basically I write down the entries instantly the next morning and sometimes, when the scene is very complex, I include one or two drawings with the main elements plus some remarks. This very dream was so interesting and powerful that I instantly began to work details out, leaving back all other paintwork with lower priority. Usually an artwork is done in the following way: First I select the title (here: Nova Roma) and choose a good main scene, referring to the scetches I´ve done. The main elements are positio-ned and the color scheme worked out. Yet this all is just a framework. The most crucial stage is the work on details in the whole scene - this brings the essence and is the story master of the artwork. I call this stage the "point of focus". Like sharpening the focus of a slide projec-tor I fill the scene with details of my dream, as well as details worked out by my imagination. As a dream is always a flowing story with countless views and details I try to pack a lot of essential parts into the work of art, some of them in detail, some of them as imagined sup-plements. 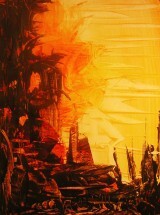 The finished painting mostly represents the essential mood and feeling of a dream, not just only a snapshot of a scene. In Nova Roma I am very satiesfied with the result. 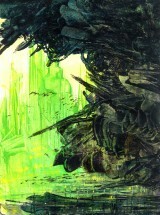 As long as I have visionary dreams like that it´s a dream to be a Visionary Artist. dreams. The most powerful paintings were created hence directly influenced by dreams. By the years I began to note and scetch the most fascinating dreams I had in my so called "Dream Dossier". It is my most valuable treasure in my work as Visionary Artist. Hundreds of exci-ting visions were brought to paper or canvas and my Dream Dossier is full of dreams yet to be revived. I can surely tell it is a wonderful task to dive into the inner visions and bring forth things unseen. In this article I would like to show you my process of creating an artwork on an example of the newest painting I´ve just finished. "An impressive Dream of visionary power that may be good for several works of art." 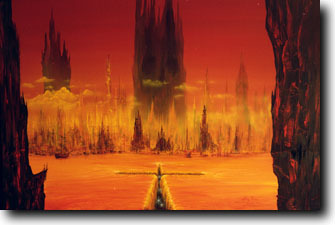 I am alone in a visionary world that is called "Nova Roma" by their inhabitants. The scene is filled with a mystic light just like in a stage show, dominated by steep clifflike mountains. The whole dream is very bizarre as neither the landscape nor the architecture has any relation to the original Rome, and most interesting were the buildings. The buildings of the whole city mainly are gothic towers, and sometimes I couldn´t tell a building from dark moun-tain structures. 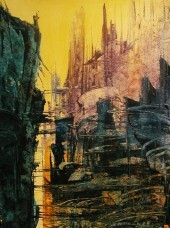 Main colors are red, siena, black and a golden light over the whole scene. The light shines very directly and seems to come from everywhere. I am standing on a high place on the black rocks and the view opens like a gate to a broad river and the city behind. 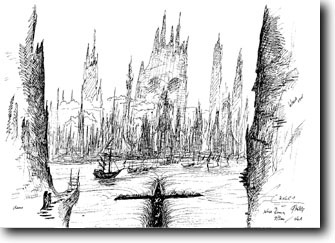 The scene includes a strange sign: In front of a high, grim rock within the city a crosslike opening cuts into the river, water pouring down in thunder into a nothingness, into a black otherworld, filled with bright stars, thus adding a strange feel to the sight. The rocks are covered with steep stairs. The steepest of them being called "Stairs of Sighs" (I can´t tell why I know the name). Suddenly I see a child falling down the whole way along the stairs, accompanied by silent sighs, and finally landing at the base, totally wounded but alive. Two nuns come rushing down the stairs and praise the "wonder" of the surviving child. This scene is repeated the whole time over (fall, survive, wonder). I feel like an Alien in an alien world."